How the Drift growth team uses account-based Personas to determine and immediately act on intent signals from users. Founded in 2014, Drift is a Boston-based technology company that provides a conversational marketing and sales platform. Its platform helps businesses better connect and engage with their prospects through live chat, email, interactive landing pages, and more. 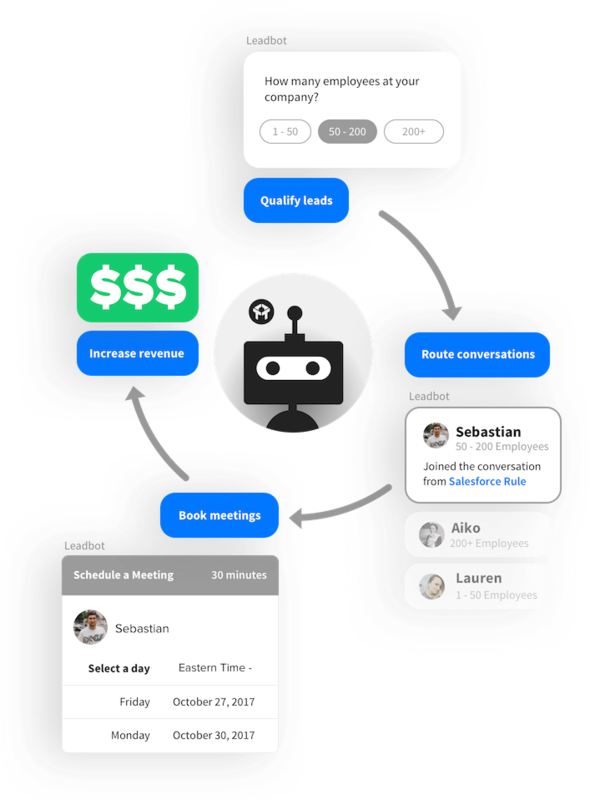 Drift is used by more than 150,000 companies and has powered millions of conversations to date. Like many growth teams in the tech industry, Drift’s growth team is responsible for continually driving leads and revenue "up and to the right" at a dramatic pace. “As a growth team, we’re always looking for ways to acquire higher quality leads at a lower cost. 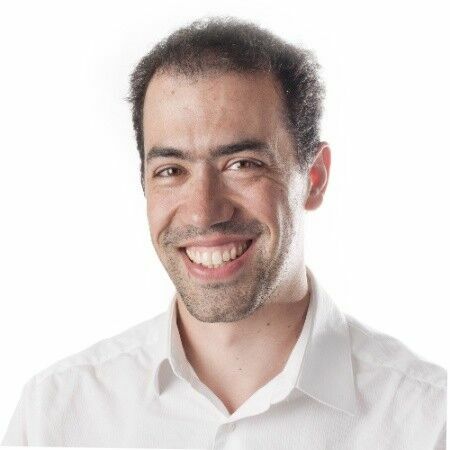 The best way to do this at scale is to understand user behavior, determine users’ intent, and automate outreach to push prospective accounts further down the funnel,” said Guillaume Cabane, VP of Growth at Drift. To do this effectively, the team needs to understand each individual user action and be able to match those actions to the larger account their team is targeting. For example, the Drift team should know if multiple people from the same account are browsing the website or taking other actions, like looking at reviews on G2 Crowd, that indicate intent to buy. However, when gathering intent data from their site or other sources, Drift typically only gets the domain, which means traditional marketing automation tools fail because the event can’t be attached to a contact record. Without the ability to attribute these account-level intent signals, the Drift team found it nearly impossible to automatically trigger relevant messages to users with high intent. The required real-time data flow was unreliable and made possible by a stitched together process using Zapier, Salesforce, and a few backend scripts. Additionally, they couldn’t sync their “high intent” user segments across the tools where they executed campaigns, such as Drift, Customer.io, and Salesforce. This led to overcomplicated data flows and sub-optimal results. Drift chose Personas to combine user and account-level data in one place, optimize their responses, and send more timely and relevant messages to prospects in the funnel. Identity and account resolution Unifies user and account history across devices and channels into a comprehensive profile for each user and account. Trait and audience building Synthesizes data into traits and audiences for each customer and account, including what users have displayed intent and how that integrates into overall account activity. Activation Pushes their user and account-level audiences to a number of tools in their stack to orchestrate personalized, real-time outbound messaging. To more quickly react to interested prospects, the Drift team used Segment’s Connections product to understand relevant intent signals on their website, like when an account or user views specific pages, engages with content, or signs up for a demo. They also brought in intent signals from G2 Crowd, Datanyze, and other sources. Then, they used Personas to understand intent at the account-level, so they could quickly determine which prospective accounts are most likely to buy. The account enters a “high-intent” audience that’s set up in Personas. The “high-intent” audience is sent in real-time to the tools that the team uses to engage customers, including Drift, Customer.io, and Salesforce. Each time a new account qualifies, the audience is updated and sent out. In Customer.io, a personalized email series is kicked off. Emails are sent on behalf of a sales representative with the goal of setting up an in-person meeting. They use Drift Meetings to make sure that process is simple. In Drift, they set up a campaign that triggers live chat on drift.com when a user at a high-value account is browsing. They use Clearbit Reveal to determine the domain for anonymous browsers. Once any user at the account responds, the entire company is automatically exited from the campaign across all channels. Lastly, Drift uses Segment to automatically update the account record in Salesforce with each interaction so their sales team can review before their first call. "We're using Personas as our new-age CRM. We identify which prospects are most likely to convert by aggregating individual user intent signals for each account. This lets us more effectively target sales resources, advertising spend, and email campaigns,” said Cabane. 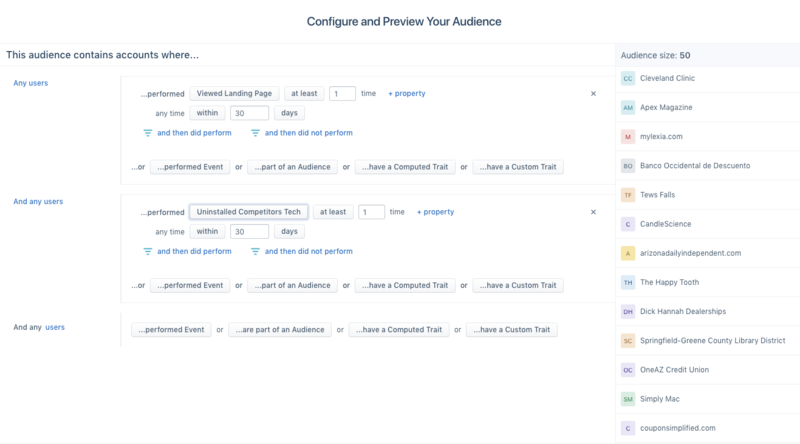 This is an audience that Drift created in Personas to identify high-intent leads that viewed a pricing page or uninstalled a competitor's product. Personas saves 40 hours per month by getting account-based audiences where they need to be. By using Personas to aggregate user behavior at the account-level, the Drift growth team has been able to more quickly and accurately gauge intent and take action on interested leads. They were able to ditch the workarounds and forego building new ETL jobs. Personas increased the number of positive conversations by 150% in 2 months. Since deploying campaigns to entire accounts with Personas, the Drift growth team increased their site-visit-to-meeting conversion rate substantially. Furthermore, by automating emails and live chats to the right prospects at the right time — based off of intent — they were able to achieve open rates of 80% and response rates of 20% as a part of this campaign. “Immediately acting on intent is so incredibly important for growth teams,” said Cabane. “It’s not unlike a retail shopping cart. Every hour you waste getting your data in the right place, the prospect’s intent quickly diminishes." Personas helped identify and create 160% increased opportunities month over month for Drift. Since implementing this new intent detection and activation process with account-based Personas, the Drift team was able to dramatically increase the leads created for their sales team. “I’m all about experimentation, and the results of what we’ve been able to do with Personas speak for themselves,” concluded Cabane. Learn more about account-based Personas here.